VMware’s recommendation is to deploy NSX controllers in odd numbers, three or greater. I have also heard, from my recent NSX ICM class that in most environments, three controllers should be sufficient, there isn’t need for much more. However, I wouldn’t recommend anything less than three because otherwise you won’t have any redundancy, and the NSX Controllers are the control plane for your NSX network, so it’s important to ensure redundancy. The reason you need three and not two, is because there needs to be a majority election of NSX controllers, with two you can run into a split brain scenario. 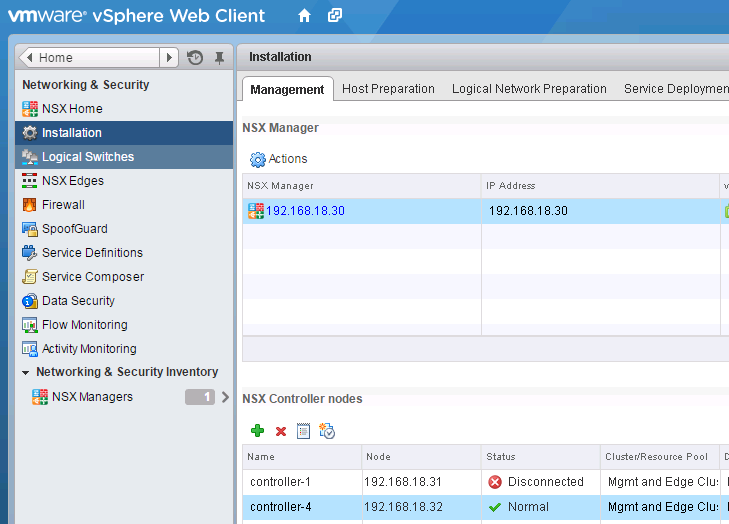 Troubleshooting NSX Controller connectivity isn’t too difficult. In fact, if you have any issues, you can always delete the rogue controller, and deploy a new one, which is probably the easiest, quickest method, or you can attempt to repair the troublesome controller. The first thing you want to do is confirm the status in the GUI by navigating to Networking & Security -> Installation -> Management. You should see a Status next to each of the NSX controller nodes. As you can see, one of my controllers is showing Disconnected. The first thing we want to try, is to find the master node. The easiest way to do this, is to run the following commands. The controller above, is NOT the master, as you can see. Logging into another controller and running the same command, you will see I found the master. To recover from a failure, you can attempt to run the command below, to see if the node will rejoin the cluster. Success! I have rejoined the cluster, and the status shows Normal on both of my nodes. You can also run some additional commands to confirm the cluster status. The command “join control-cluster 192.168.18.32 force” can only be executed from the Master Controller or it can be executed from any of the controllers. Let me know if my understanding is right. Rajeev, no, it should be executed from the disconnected node. the IP you use, is the IP of the master controller. i m running nsx 6.2.3 .. did the syntax hange ? I had a single controller in my cluster and showed as disconnected. After running this force join command from the controller with his IP it connected and changed into a master role. I was then able to add the rest of controllers …. What happens if the master for the particular role fails in the controller cluster ? whether new master will be elected or how the process is.